Instantly increase the functionality of your iPad with an Apple keyboard. Stylish, sleek Apple looks combine with convenience and function for incredible comfort no matter how long you’re typing for. 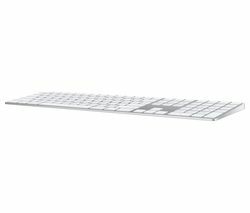 The Apple keyboard range gives you two simple, slick keyboard options. 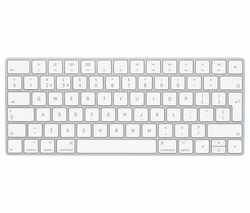 The full size Apple keyboard with numeric keypad plugs in via USB, while the more compact wireless model gives you go-anywhere capabilities, connecting to your devices via Bluetooth. Whether it’s for work or play, these keyboards help you get more from your iPad experience, making it even easier to compose emails, browse online and more. All Apple keyboards are based on an elegant and durable ultrathin anodized aluminium chassis, with MacBook-style low-profile keys for a responsive feel. Lower keyboard keys make for comfortable typing. Go wireless for use within 30 feet of your Mac or iPad, and a compact design that takes up 24% less space on your desktop than full-sized keyboards. Wireless models run on just AA batteries and use intelligent power-management to conserves battery life, automatically powering down when not in use. For the ultimate in practical, wireless typing and comfort for your tablet and computing needs, Apple keyboards are the perfect stylish solution.